WFDF's 2018 World Junior Ultimate Championships finished last weekend with USA Ultimate Under-20 National Teams winning gold in both divisions. The men's and women's teams were rostered with players from all over the country. 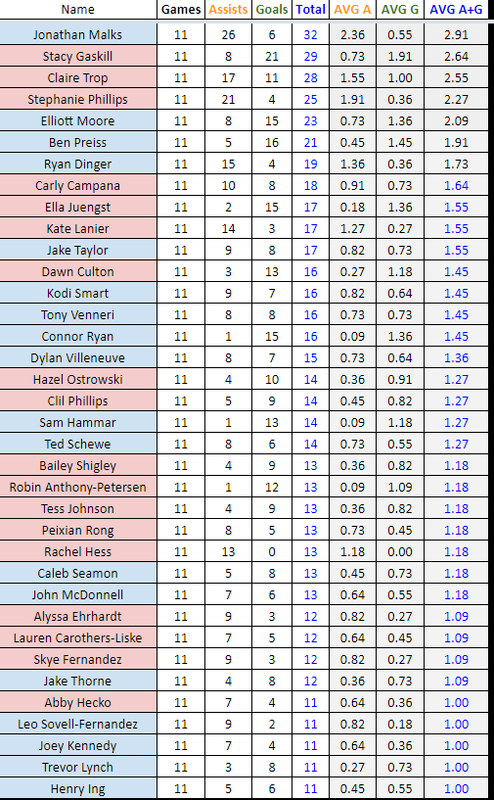 Using the provided WJUC data, here is a compilation of the offensive leaders for both the USA Ultimate teams. One player averaged at least 1 assist + 1 goal at WJUC: Claire Trop [1.55 assists/game; 1 goal/game] in 11 games. Every player on the USA's U-20 men's roster threw at least 1 assist + scored at least 1 goal. WFDF's World Junior (Under-20) Ultimate Championships finished on Saturday, August 25. Thirty-one (31) teams from 18 different countries played in the men's (boys) and women's (girls) WJUC divisions. USA National Teams combined for a (22-0) record at the international ultimate event and two gold medals. 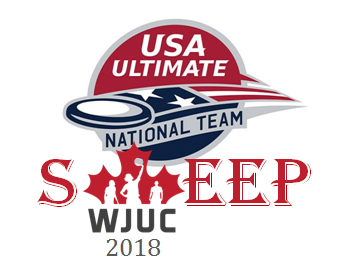 There have been 3 sweeps in the history of WJUC; twice by USA (2006, 2018) and once by Canada in 2002. USA National Team won 15-10 over Team Canada. USA's win is their 8th WJUC gold -- the most by any country in this WJUC division. Also, this is USA's 7th gold medal in the past 8 WJUC events. Bronze was won by France - their first-ever WJUC medal. USA National Team won 15-8 over Colombia. USA's win is their 4th WJUC gold, which is the most by any country in the WJUC women's/girls division. Canada won bronze. 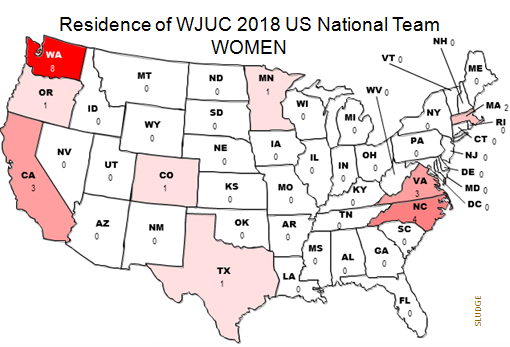 WJUC 2018 marked the 5th consecutive WJUC where Canada, Colombia, and USA have been the top-3 teams in the women's division. After endorsing a 2018 bid for the World Junior Ultimate Championships, Canadian Prime Minister Justin Trudeau was prompted (?) to address the gathering of 18 nations in Waterloo. Trudeau: "I played a lot of ultimate in my youth. I was even an ultimate coach...If any sport can change the world, it's gonna be ultimate." The 2018 World Junior Ultimate Championships is moving to the playoff stage. WJUC events began in 1983 for the men's division and in the year 2000 for the women's division. 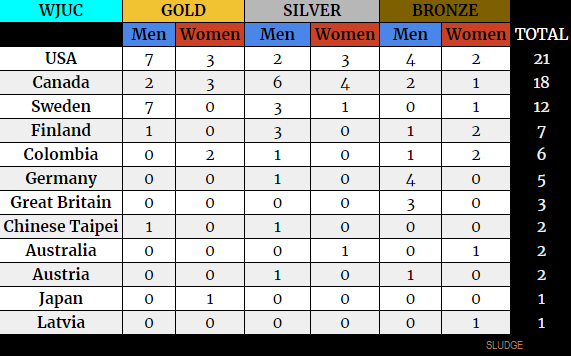 USA leads with the most earned medals with a total of 21. Canada has won the second most medals with 18, followed by Sweden with 12 total medals (10 of which are gold). 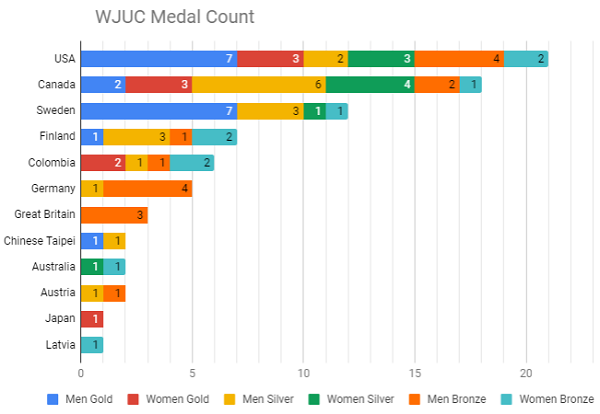 12 = # of different countries that have medaled at WJUC. NOTES: USA did not participate in the 1983, 1984, 1986, 1992, and 2002 WJUC events; other countries non-participation was not researched. There was a tie for bronze at 2006 WJUC Women's division. 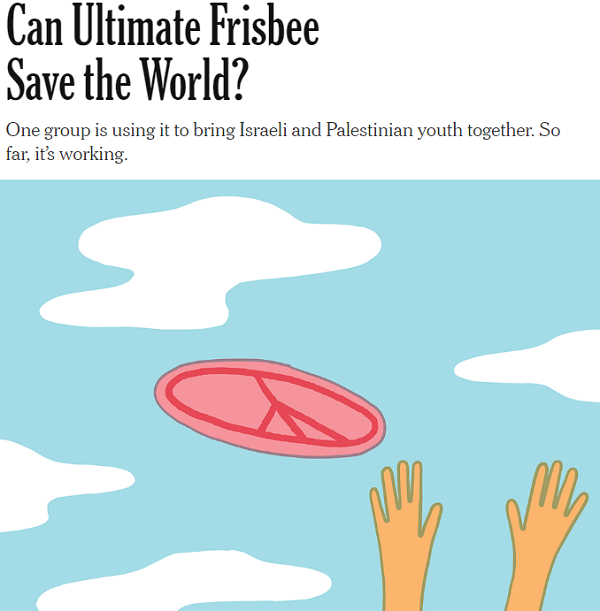 The New York Times published an opinion piece, "Can Ultimate Frisbee Save the World?" written by Jennifer Finney Boylan which highlights the amazing efforts by Ultimate Peace. David Barkan, who volunteers as the chief executive of Ultimate Peace: "We're not trying to bring peace to the Middle East. That's not the goal. It’s about changing a mind-set through the values of the sport that we know leads to peace between people." The World Junior Ultimate Championships are underway in Waterloo, Canada. 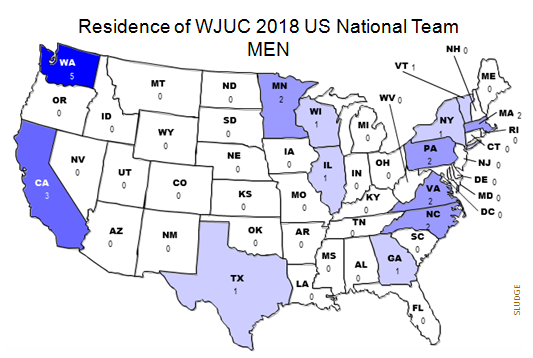 The United States is one of 13 countries who have both a men's and a women's team competing at WJUC 2018. Overall, fifteen (15) states are represented on the USA Under-20 rosters. Washington state is well represented with a total of thirteen (13) U-20 players on the USA rosters - accounting for 27% of the USA U20 combined rostered players. As a comparison, California and North Carolina at 6 players each are tied at second, Virginia is third with 5 players. The 2018 World Junior Ultimate Championships begin in Waterloo, Ontario, Canada on August 18 and conclude on August 25. Thirty-one (31) teams from 18 different countries are scheduled - in the men's and women's division - to complete at WJUC 2018. As a comparison, WJUC 2016 had 49 teams. Madison Radicals finally won an AUDL Championship. The Radicals are tops in the American Ultimate Disc League after winning their 1st AUDL title. 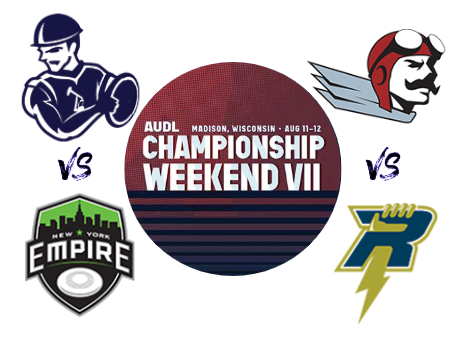 Madison has been a consistent winner in the Midwest Division and the Radicals have always advanced to the AUDL Championship Weekend in every season. After 3 losses in the semifinals and 2 losses in the finals in past Championship Weekends, Madison won the 2018 AUDL Championship over Dallas Roughnecks by the score of 20-16 [10-8 halftime]. The Radicals held the Roughnecks to their lowest goal total in the AUDL 2018 season. In an ISTHMUS article preceding the weekend, Radicals head coach Tim DeByl was quoted: "I feel as confident coming into a Championship Weekend as I ever have." The Radicals team collectively won a total of $20,000 in addition to the AUDL trophy. 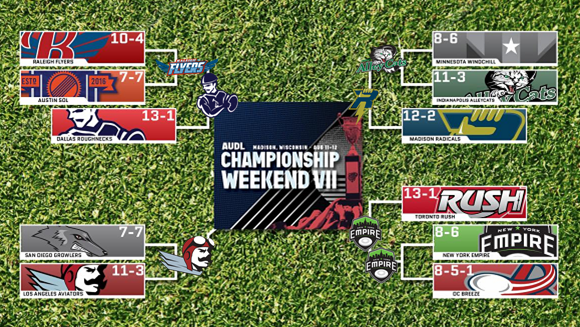 AUDL Championship Weekend VII was hosted in Madison, Wisconsin at Breese Stevens field. Madison is the sixth different AUDL team to win the championship over 7 seasons. Radicals are the first Midwest Division team to win the AUDL trophy. Madison now posts a record of (10-5) in the AUDL postseason over six seasons. The final weekend of the American Ultimate Disc League 2018 season* concludes with AUDL Championship Weekend VII. Four team representing each AUDL division have earned their spot to Madison. The Radicals are perennial contenders, Dallas Roughnecks have been here before (literally), New York Empire return to AUDL semifinals, and Los Angeles Aviators are first-timers to the AUDL Championship Weekend. The favorites from the West (Aviators), Midwest (Radicals), and South (Roughnecks) Divisions all advanced to Championship Weekend. The New York Empire (East Division) are the only semifinalist team not to win their division's regular season crown; the Empire are the first-ever team to finish in 3rd place of the division to advance to Championship Weekend. *During the 2018 AUDL season, there was an AUDL boycott and WFDF Club Worlds. The 2018 Youth Club Championships at USA Ultimate's U.S. Open included three divisions - boys, girls and mixed - for the Under-20 players and two divisions - boys, girls - for the Under-17 level. 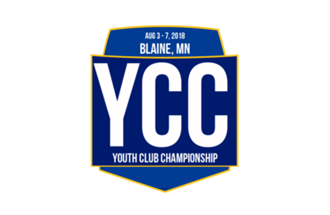 YCC ultimate competition concluded August 6 in Blaine, Minnesota. 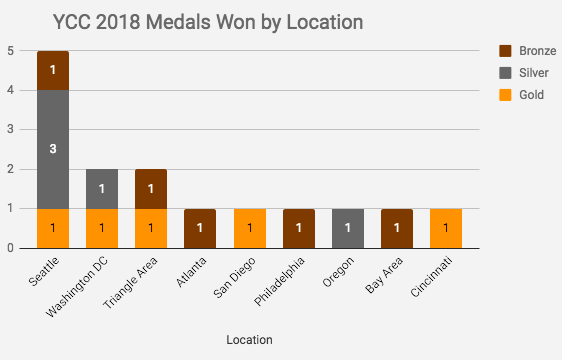 5 = # of Seattle YCC teams that won a YCC 2018 medal; one in each division at YCC 2018. 9 = # of different locations that medaled at YCC 2018. 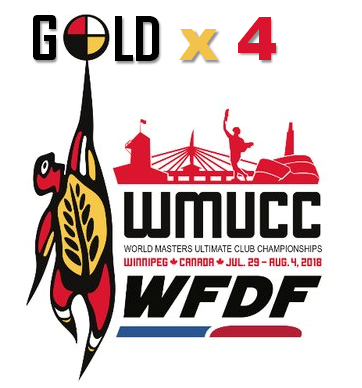 Club ultimate teams from the US swept gold at WFDF 2018 World Masters Ultimate Club Championships - just like at 2018 WUCC. Of the 23 teams representing the USA, ten (10) teams medaled. The day you have been waiting for since has arrived! 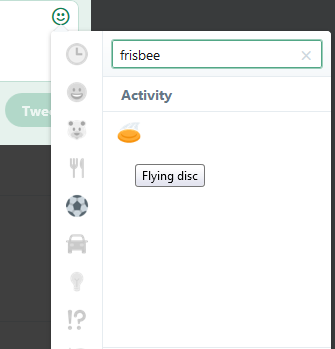 A frisbee emoji is an available option via desktop Twitter listed in the 'Activity' section of the emjoi menu. The flying disc emoji - as approved in Unicode 11.0 - is expected for all devices in late 2018. Sort of like at 2017 World Championships of Beach Ultimate, the golden yellow flying disc is available over the traditional white disc. After last year's sweet hype video about the sport of ultimate, USA Ultimate throws together another good one. This commercial, which debuted on ESPN 2 tonight, shows some live-action from a game between 2 teams of invited players. Long live Grit and Grace. Long #LiveUltimate. The 2018 WFDF World Masters Ultimate Club Championship games are set. 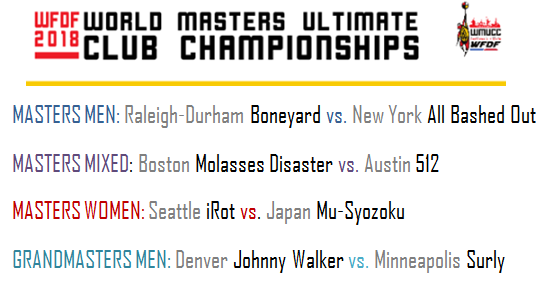 All club ultimate teams from the United States except for Japan's Mu-Syozoku in the women's division. The Grandmasters final will be played on Friday, August 3rd @ 7:00p CDT. The other division will be playe don Saturday, August 4th; Master Men @ 09:30a CDT, Masters Women @ 12:00p CDT, and Masters Mixed @ 2:30p CDT. Day 5 is done and 4 club ultimate teams in each division have advanced. 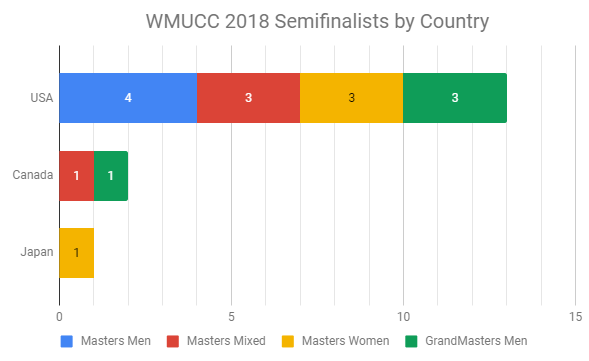 USA is represented the most with 13 club ultimate teams; Canada (GM, MW) has 2 teams and Japan (W) has 1 club ultimate team in the semis at the WFDF World Masters Ultimate Club Championships. 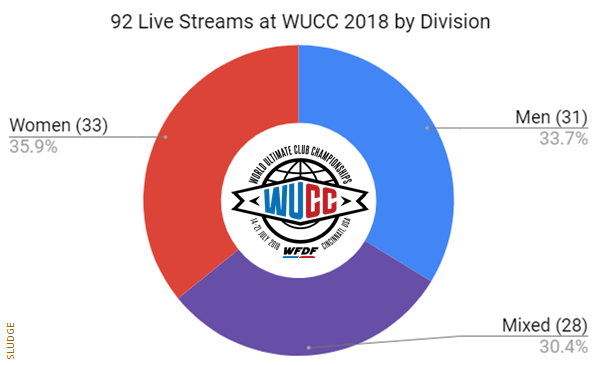 Canada, Japan, and USA combined for 52 (72%) of the 72 teams competing at WMUCC.